Dr. Signe Bray's work on brain development in children and adolescents is now online in Human Brain Mapping! Click here to read the abstract. Data sharing in neuroimaging allows groups from all over the world to make use of unique data sets. We have a new paper out today that used anatomical, arterial spin labeling and functional data from the 'Pediatric Template of Brain Perfusion' study (http://palgrave.nature.com/articles/sdata20153). 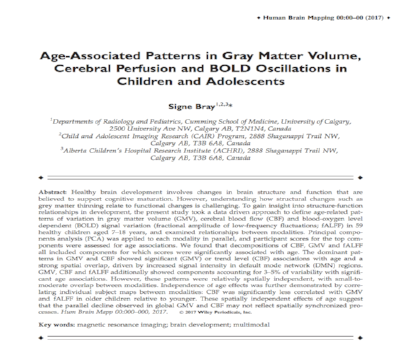 We found that although there were similar declining age effects on gray matter volume and perfusion, the spatial patterns of these changes were largely independent. This means that multimodal imaging is necessary to get a clear and accurate picture of how the brain matures, and also that models linking changes in volume with changes in blood flow and function are more complex than one might expect. Newer:Meet us at INS 2017Older:Congratulations, Christiane!